In today's first match, Gujarat Fortunegiants keep their unbeaten run as they beat Dabang Delhi 45-38. In the second match on Day 25, UP Yoddha and Bengal Warriors again drew in their clash in the Vivo Pro Kabaddi League (PKL 2018) Season six. Maninder Singh made the difference for Bengal as he got 14 touch points to nearly score half the points for his team. Rishank Devadiga got 10 points whenever Surjeet Singh was absent and helps his team dominate. Nitesh Kumar caused trouble to Maninder Singh to get 4 tackle points while Narender constantly failed against him. Azad Singh was the super sub for UP Yoddha as he got 4 touch points in 5 raids. UP Yoddha entered this match with grit to finally win a match at home and break the home leg curse while Bengal Warriors started positively with Maninder Singh returning after the injury. Jang Kun Lee opened the score for Bengal in the 2nd minute by getting a running hand touch on Jeeva Kumar to make it 0-1. It was Rishank Devadiga who took advantage of a mistake by Surender Singh to make it 4-2 by getting Surender and Adarsh T out in the 4th minute. The match continued to be really close as both teams cancelling each other’s leads. Maninder Singh got Narender to get the touch points for Bengal in the 11th minute to make it 6-7. This continued to happen regularly as Narender gave away himself easily to the long hands of Maninder. Mahesh Goud was neutralized in the 15th minute by a really strong double ankle hold by Nitesh Kumar to make his mark on the match. Jang Kun Lee tried to leap over Sachin Kumar and Narender but was caught by their chain hold in the 20th minute’s Do-Or-Die raid to equalize the score to 11-11. The half ended with Bengal just edging past UP by 11-12. The second half saw the same results as both teams continued to score alternatively. Azad Singh came in as a substitute in the 25th minute Do-Or-Die raid to get a rusty Mahesh Goud to take the lead for UP with 15-14. Nitesh Kumar then got a really strong ankle hold on Jang Kun Lee after Lee regularly failed to get a bonus point in the 26th minute raid. Rakesh Narwal was saved in his 26th minute raid by Nitesh Kumar who attempted an ankle hold after he stepped out of the mat and makes it 17-16 in favor of UP Yoddha. Narender then finally got the better of Maninder Singh to inflict the All Out with a double thigh hold and make it 21-17 after being caught out 4 times before this. Maninder Singh got a Super Raid in the 33rd minute by getting Narender, Nitesh Kumar and after the review, Shrikant Jadhav to equalize the score again to 23-23. This led to an All Out on UP by Maninder Singh again after he got Sachin Kumar and Rishank Devadiga to take the lead to 26-28. Rishank Devadiga achieved his Super 10 and 500th career raid point in his 37th minute raid where he got Surender Singh and Shrikant Tewthia, getting rid of the right defensive side in one goes and make it 28-28. A great effort by Adarsh T to get Rishank Devadiga changed the status quo as Bengal took the lead and brought back Surjeet Singh. The game made some really edge of the moment situations as Jang Kun Lee slipped to tie the score and a great review by UP helped them draw the game again and make it 30-30. In the first match, Gujarat Fortunegiants maintained their winning streak after a 45-38 win over Dabang Delhi KC in the ongoing sixth edition of the VIVO Pro Kabaddi League on Sunday. Delhi's Chandran Ranjit and Naveen Kumar tried their best to make an impact on the match by getting 11 and 8 raid points however, they were let down by the experienced corner pair comprising Ravinder Pahal and Captain Joginder Narwal, who collected three tackle points in total between them. Also, Gujarat's raider Dong Geon Lee, who was brought in for Sunday's match, caused problems for Delhi after getting a super 10, while Rohit Gulia collected seven raid points. Gujarat started the match with a toe touch by Rohit on Vishal in the first raid of the match. They continued to dominate Delhi with Rohit getting a super raid with a bonus point and touch points on Vishal and Yogesh Hooda to make it 5-1 in Gujarat's favour by the 3rd minute. Gujarat later inflicted an all-out on Delhi by the 6th minute to take a huge 11-3 lead. It looked like Delhi were moving towards another loss, but they got a boost of optimism with Naveen and Ranjit, who managed regular touch points on Gujarat. 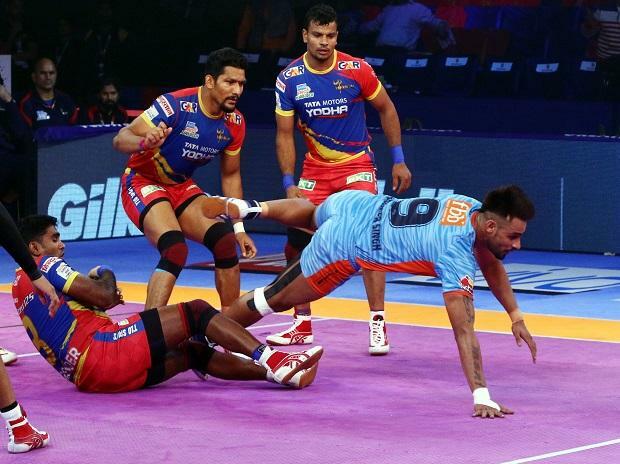 The first-half ended with Gujarat taking a 9-point lead with the score reading 27-18 in their way. In the second-half, Delhi came with a positive attitude to get the Gujarat defence weakened by getting Parvesh and Sunil out by the 23rd minute to make it 20-29. Later, Gujarat got a super tackle as Naveen entered the lobby without a touch while Sachin got out of the mat. Rohit Gulia was also giving soft points to Delhi as he tried to tackle the raiders regularly. Parvesh Bhainswal got a super tackle with a strong thigh hold on Ranjit to extend Gujarat's lead to 24-36 by the 27th minute. Delhi tried to make a comeback by inflicting an all out on Gujarat when Ranjit got Parvesh and Sachin out in the 30th minute to reduce the lead to 7 points. Lee was causing trouble for Delhi with his agility and quick movements by regularly getting Ravinder to make mistakes. The 36th minute saw Ruturaj Koravi dash onto Ranjit to cause an injury to both of them. The 37th minute saw Yogesh Hooda concede a super tackle by Sachin Vittala as Gujarat stretched their lead to 44-38. Gujarat made sure to win the contest by slowing down the match with empty raids and hence won it 45-38.